My intermediate class just finished a still life painting of a silver tea pot with a glass bowl of cherries. 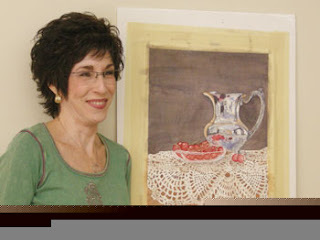 This is Barbara and her finished piece. This is special because Barbara actually polished the silver piece for me that we used as the reference for this painting. Great job on your painting, Barbara! And thanks so much for making the silver look like new!!! More classes are beginning in February. You can visit my website to see the list, register and view the supplies list. We have been working hard to get our new teaching studio ready and so I haven't had a lot of time to work on lessons for this blog. I have been taking progress photos of some pieces we've been working on in class, so I hope to have some new lessons up soon. Stay tuned! Thanks for visiting. You can see pictures of the new studio by visiting our Art and Antiques Studio Facebook page. The teaching studio is called Courtyard Studio, but we are affiliated with the Art and Antiques Studio and Gallery next door. Visit our Facebook Page and become a FAN!